I asked Joynt for some literature on this combined measure. Below is a concise summary of what she sent me. The ESCAPE Trial investigators and coordinators published study findings in a 2005 paper in JAMA. They sought to determine if pulmonary artery catheterization (PAC) improved outcomes in patients with recurrent heart failure. Their primary outcome measure was days alive and out of the hospital (DAOH) after randomization. 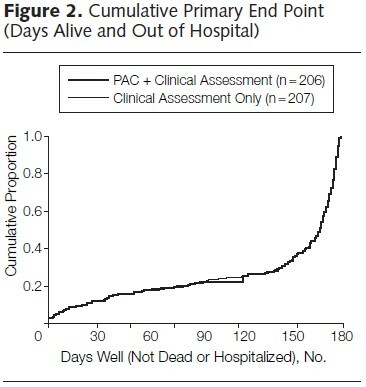 As the chart below shows, PAC did not affect this outcome. A 2011 paper in the American Heart Journal by Ariti et al. also examined DAOH, both in absolute and percentage terms. They compared heart failure patients on candesartan vs placebo. [DAOH] has a number of advantages over time-to-event measures. First, it accounts for both the number and duration of multiple hospitalizations. The incorporation of these factors into a continuous outcome has the potential to add statistical power to detecting treatment differences. Importantly, it gives greater weight to mortality. For instance, if a patient has a short hospitalization in week 1 because of worsening symptoms but survives and is not hospitalized for the remainder of their follow-up, they will have a larger DAOH measure than a patient who has a cardiovascular (CV) death in month 2 of follow-up. A typical time-to-event outcome consisting of time to first hospitalization for HF or CV death would suggest that the first patient did worse than the second. In addition, DAOH is an objective measure and so does not have the issue of adjudication that is required for cause-specific outcomes. Ariti et al. also considered DAOH as a percent of potential follow-up time (%DAOH). 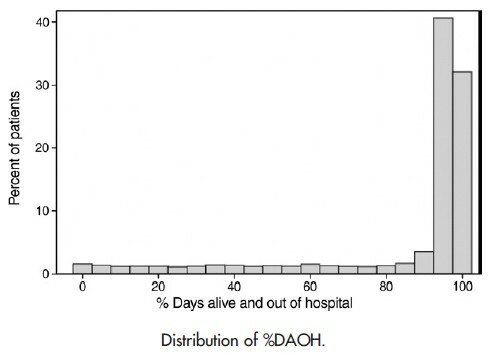 In conclusion, the use of DAOH, and especially % DAOH, provides a valuable tool for summarizing the overall impact of a treatment on mortality and morbidity. Its ability to capture all hospitalizations and to give greater weight to mortality means that it gives an informative quantified perspective on the absolute benefit of any new treatment. There are several limitations in the use of DAOH that should be considered. 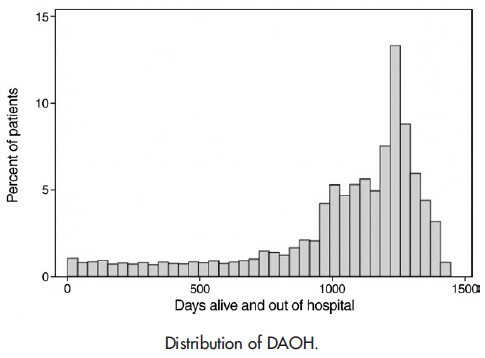 First, DAOH is much influenced by deaths that occur early in follow-up so that in studies with a high mortality rate, some may feel that the impact of hospitalizations gets underrepresented. There are some obvious ways in which DAOH as calculated in the forgoing studies would not work as a hospital quality measure. First, there’s no randomization in the real world. When does the DAOH clock start? I see two options: at time of index admission or at time of index discharge. The former would capture length of stay (LOS), penalizing longer LOS to the extent they were not offset by lower mortality or reduced chance of rehospitalization. The other question is, when does the clock stop? DAOH for how long? A 30-day window would be consistent with current 30-day mortality and readmission measures. Longer follow-up times could be considered, though they would put the hospital at greater risk for care and conditions beyond its walls. [I]f a patient died during their index  hospitalization, they were assigned 0 days alive and out of hospital, if a patient was admitted for 5 days, then re-hospitalized for 6 days 90 days later then subsequently died at 103 days after their index hospitalization they were assigned 92 days alive and out of hospital, if a patient was admitted for 7 days but then was not re-hospitalized and survived to the end of the ascertainment period (for instance 180 days) they were assigned 173 days alive and out of hospital. They speculated that changes in the 30-day measure was driven primarily by changes in early mortality after discharge. Should CMS consider DAOH as a measure of hospital quality? Why or why not? If so, is should the DAOH clock start at index admission or discharge? And when should it stop? PS: Joynt also suggested this 2009 paper by Allen et al., but I didn’t find that it added anything important for this post. I mention it for completeness. * For some reason this link isn’t working. Here’s the full reference: Wasywich, C. A., Gamble, G. D., Whalley, G. A., & Doughty, R. N. (2010). Understanding changing patterns of survival and hospitalization for heart failure over two decades in New Zealand: utility of ‘days alive and out of hospital’from epidemiological data. European journal of heart failure, 12(5), 462-468. Whats best for patient probably dovetails with hospital payment incentive and % penalty. With DAOH, 5 two day stays over 90 days (10 days in house), may yield high $ return and ranking vs with current system–more punitive. Extreme, obviously, just demonstrating the possibilities of unintended consequences. For a Medicare eligible person with multiple co-morbities, there is no method to reliably assess a person’s physiologic stability at the time of any hospitalization, let alone at the time of discharge. The lone exception would be diabetes with a hemoglobinA1c at the time of admission. This is particularly true for congestive heart failure, since the clinical proress of CHF is unrelated to the cardiac ejection fraction (as noted by a Mayo Clinic study published about 5 years ago). Overall, most Medicare eligible patients in the hospital have multiple co-morbities. Chief among these is chronic lung disease aggrated by our inability to assess the related energy requirements for pulmonary function. When the energy requirements advance to high levels, then the energy requirements for renal, CNS as well as cardiac funtion are compromised. As a result, I share your basic doubt about the meaning of re-admission rates.